Why Alagappa University Distance Education? Alagappa University is a premier academic institution located at Karaikudi in Tamil Nadu. The university was formed in May 1985 by a special act of the government of Tamil Nadu under the aegis of University Grants Commission of India (UGC). The Directorate of Distance Education (DDE)-Algappa University was formed in 1992. It facilitates and provides 14 undergraduate programmes, 26 postgraduate programmes, 6 postgraduate diplomas and few certified and in-service programmes in various fields of science, education, management, and arts. The Alagappa University Distance MBA is renowned in southern India. The distance education programme of Alagappa University was formed under the special act of the government of Tamil Nadu. It works under the guidance and norms of the University Grants Commission. The university has been accredited with A+ grade by NAAC with 3.64 CGPA in the third cycle. Alagappa University has Ex-post facto approval Distance Education Council for 108 programmes offered under DDE at the premises. 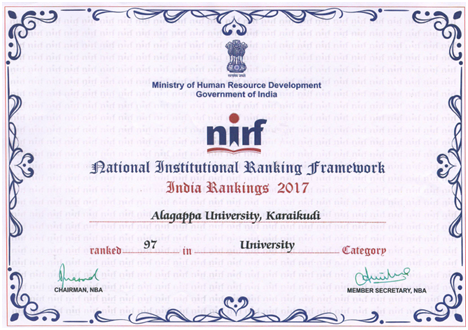 Alagappa University has been ranked at 97th spot by Ministry of Human Resource Development, Government of India under the National Institutional Ranking Framework in 2017. Step-1: The applicant can obtain the prospectus and application form from The Directorate of Distance Education after submitting a demand draft payable in favor of The Director, DDE, Allagappa University or download it directly from the official website and include the prospectus fees in the documents attached to the final application. Original entry qualification of higher secondary/diploma/ degree, as applicable according to the norms. Student index card along with affixed signature and a Download student index card from the official website. 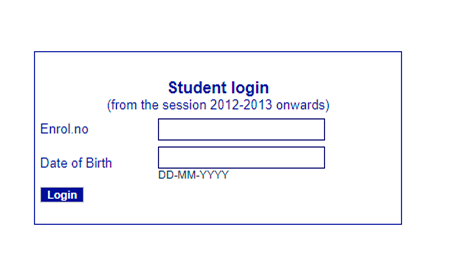 Step-3: Send the duly filled form along with the documents to the following address before the last date of applying. Step 4- Obtain the course material directly from the university and attend the classes at Karaikudi. Step 1- Applicant can obtain the prospectus and application form from the concerned learning center on payment of prescribed fees or download it directly from the official website and include the prospectus fees in the documents attached to the final application. Student index card along with affixed signature and a Download student index card from the official website or directly click the following link- http://alagappauniversity.ac.in/research/60. WORD OF CAUTION- Do not pay any fee in cash to the learning centre. Strictly adhere to the above process. Step 3- Submit the duly filled form along with the documents to the learning center. Step 4- Student shall get the course material through learning center and attend contact classes at the concerned learning center itself. Candidates can pay the fee only through the offline mode at Alagappa University. However, there are two offline methods for paying admission fees. Demand draft- As mentioned in the Annexure-1 of the prospectus, the student has to make a demand draft of the prescribed fee and send along with the application as already explained. Cash Counter- Fees can also be paid directly at the cash counters available at the Directorate of Distance Education (DDE) campus. The last date for applying to varied courses in Alagappa University is 31st March of every year for semester courses and 31st May of every year for non-semester courses. For Admission in MBA – A Pass in any degree 10+2+3 or 10+2+4 pattern. For Admission in M.Ed.- B.Ed., with 55% for OC and 50% for BC/MBC/SC/ST, in aggregate. Those who have completed the B.Ed., course can also apply. Financial incentives are provided to the students by the state government and central government from time to time. Some of these scholarships have been mentioned below. Apart from the basic governmental grants, the university has also created AURF i.e. Alagappa University Research Fellowship, which provides grants to students undertaking various kinds of research work. The Alagappa University Distance Education fee structure is nominal. Some of the courses pay a fee per semester as well as for non-semester. There is a fixed schedule for payment of fees and students must ensure that they pay a fee according to the date to avoid the fine of any sought. If the student is not able to pay the fee by the above-mentioned dates, the amount of fine for delay of one year is Rs.500 and for beyond this period it is Rs.1000. Tirupuvanam Dr.S. Wilson, Alagappa University Evening College, St. Mary’s Matric Hr. Sec. School Campus, Tiruppuvanam-630 611. Paramakudi Dr.M.K. Ganesan, Alagappa University Evening College, Sourashtra Hr. Sec. School Campus, Paramakudi-623 707. Rameswaram Dr.G. Kalaiamuthan, Alagappa University Evening College, Govt. Hr. Sec. School Campus, Rameswaram-623 526. Thondi Dr.K. Baskaran, Alagappa University Evening College, Wilcom High School, Tondi, Ramanathapuram Dist. Ramanathapuram Dr.P. Brindha, Alagappa University Evening College, Municipal Girls Hr. Sec. School Campus, Ramanathapuram-623 504. Anna Nagar – Madurai Mr. Theagarajan, Sri Aurobindo Mira College of Education, Students Computer Centre, 394, Anna Nagar Main Road, Anna Nagar, Madurai . Nagercoil Mr. S. Retnam, Sivanthi Adhitanar College of Arts & Science, ICUS, ASHFAAQ Complex, Opp. Anna Bus Stand, Nagercoil – 629 001. Palayamkottai – Tirunelveli Mr. G. Ralllinson Packiaraj, St. John’s College of Education, JENO Educational Organization, Western Tower Complex, Palayamkottai, Tirunelveli – 627 002. Paramakudi Mrs. P. Jeevarathinam, Sree Vari Mayasudhan College of Polytechnic, Rajalakshmi Academy for Hr. Edn., 10/2/303, D. Pandian Street, Opp. Sub Registrar Office, Near Old Telegram Office, Paramakudi – 625 370. Puliyangudi K.S. Mani, Annai Meenakshi College of Education, Brys Info Software Training & Development, 18, Balavinayagar Kovil Street, T.N. Puthukudi, Puliyangudi – 627855. Madurai Mrs. C. Chitra Sri PSY College of Education, 6 th Floor, Aparna Towers, Bye Pass Road, Madurai. Aranthangi Mrs. S. P. Porchelvi Naina Mohammed College of Arts & Science College, No. 2, Sri Ganesh Complex, Opp. State Bank, Aranthangi – 614 616. Tiruppuvanam Mr. J. Deivendra Kannan Vickram Teacher Training College, D.No. 18/48, P, Madurai Main Road, Near Vellammal School, Tiruppuvanam – 630 611. Pudukkottai Mr. T. Ganesh Chenduran Engineering College, 3690, South 4th Street, Pudukkottai – 622 001. Sankarankoil Mr. K.S. Mani Annai Meenakshi College, 4/2, I Floor, Parvatham Gomathi Complex, North Car Street, Sankarankoil – 627 756.